A former stray cat will have her paws full this Christmas after giving birth to a staggering 11 kittens – one of the largest litters on record. Tabby puss Donatella astounded staff at Cats Protection's Bridgend Adoption Centre after she went into labour yesterday (December 22) and produced the bumper brood of youngsters. Although one was sadly stillborn, the 10 remaining kittens and their mother all appeared in good health after a five-hour labour. Donatella, thought to be aged around one-year-old, was handed into the charity just a week earlier after a householder who had been feeding her noticed she was heavily pregnant. Cats usually give birth to an average of three to six kittens, with larger litters normally resulting in a higher mortality rate. The world's largest litter was born in 1970 when a Burmese/Siamese cat gave birth to 19 kittens, four of which were stillborn. Cats Protection's Bridgend Adoption Centre Manager Sue Dobbs said: “I've never seen this many kittens in one litter in my 16 years at the centre. We just couldn't believe our eyes as they kept coming. “Donatella is a tiny cat, and having been a stray she is also very underweight. I thought she may have five or six, but I wouldn't have been surprised if she had lost some of them considering her poor condition. So to have this many surviving kittens is incredible. “Despite all she's been through she is an amazing mum, she's been very calm and attentive to all her babies. 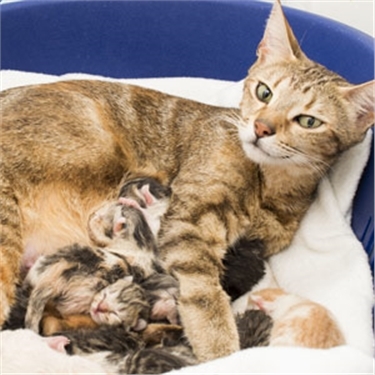 “At the moment we're going to give her the chance to raise them all, but we'll be keeping a close eye on her and monitoring their growth rates and we expect we may need to help by bottle-feeding some of the kittens. The main challenge at the outset was to ensure all of them get some of the vital first milk from their mother to help their immune systems. Cats Protection's Clinical Veterinary Officer Beth Skillings said it was rare for such a large number to be born alive. She said: “The large litter is in itself unusual, but for so many to survive the birth is exceptional. Late pregnancy is very draining even for cats in good health, so for an underweight stray like Donatella it would have been particularly gruelling. “First time mums usually have smaller litters, so it's possible Donatella may already have had a litter, despite being so young herself. “It's hard not to find Donatella's story heart-warming, especially at this time of year. But it's important to remember this is not a fairytale – Donatella was a stray who has been through quite an ordeal to carry and give birth to so many kittens. “She is lucky that someone noticed her and handed her into us as it is likely that many more of her kittens would have perished otherwise. For further information or an interview, please contact Cats Protection’s Media Office on 01825 741 911, at media.office@cats.org,uk, or @CPMediaTeam on Twitter.